What about an easier styling/theming system? 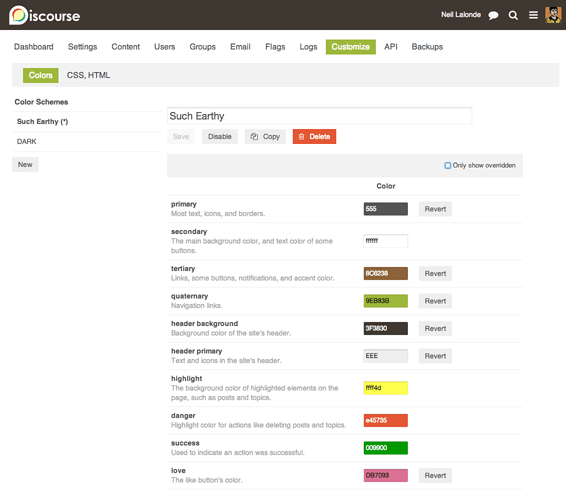 Perhaps color scheme plugins for those of us who are not artistically or design inclined? Not a bad idea - I just recently saw http://www.colormoo.com/ on hackernews and was pretty impressed. You also have https://kuler.adobe.com/ to find colors scheme. The CSS, HTML tab is the existing “Site Customization” stuff. Better name ideas are welcome. Also, what is a “Theme”? I imagine it’s a bundle that includes one (or more, but choose one?) color scheme, and CSS and HTML. If this means being able to change colors rather than override them I’m all for it! Nice work thus far! Override in that context means that it’s different than Discourse’s default theme. What do you mean by change? For example if I set a link color to red then I’d like the CSS that was defining the link color as blue to be changed to say red, rather than have it define a new css rule which simply overrides the color value (this causes issues with CSS transitions, and is overall just messy and error-prone). Oh, yeah it changes. ie, It writes the variables with the configured values once. Is there a place to customize embedded discourse CSS? I start to play with Ghost blog with my dark theme and I also need to custom the embedded css stylesheets. http://blog.onaldan.com/avril-2014-turquie-cappadoce/ (at bottom). The themer is available to use! Give it a try! I think the default button colors should also be settable or adjust automatically for enough contrast between them and the background color. With a light greyish background the buttons disappear. Which detects the difference in lightness between the $primary (text etc,) and $secondary (background, etc) variables and adjusts how scale-color functions (this effects borders and a bunch of other minor elements right now). That’s a pretty simple function… buttons could certainly work in a similar way, as outlined in this article about button text. Thanks, this, along with some other recent improvements, made Discourse customization easier. I was wondering if there were other steps planned to the process in the near future to allow more styling customizations? 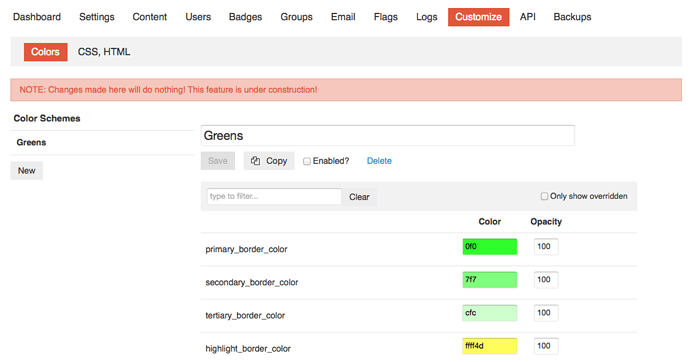 We don’t have any plans for per-user theme selection at the moment. Something like Stylish may be of use? There are versions for both Firefox and Chrome. Thank you - I think most of my users will find a browser plugin to be too cumbersome, but I’ll mention it anyway. I think we will try to have our resident UX artist create a theme that would meet the needs of most of our userbase. Are there plans for a Discourse theme repository? Is it possible to set these values from a plugin yet? That would make this a lot more useful and powerful. As a suggestion, you should be able to change fonts as well. Preferably from google fonts to make it simple. The names match the ones in the colors.scss file.